The news about Google Now was disclosed in a developers' log posted to the Internet last Friday by the company. According to the log entry, Google's engineers have created a "skeleton" to implement Google Now in Chrome that shows cards created by the service as notifications. By hooking Google Now into its Chrome browser, the service has the potential to become a cross-platform offering, since Google makes versions of the browser for Windows, MacOS X and Apple iOS operating systems. That contrasts with Apple's personal digital assistant Siri, which only works on some Apple devices. 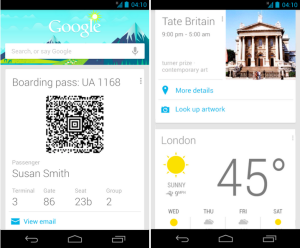 Google Now is designed to predict your information needs and display them as virtual cards. So when you turn on your phone at home in the morning, Google Now might push the latest weather forecast to you. As you get in your car to drive to work, it will push the latest traffic information on your route to you. It also has a Siri-like voice search function. Although the idea behind Google Now may be creepy to many people who believe the search giant already knows too much about them, expanding the service to Chrome could be very fruitful for the company. That's because it will establish an over-arching mechanism for funneling eyeballs to Google's bread-and-butter services such as Google Maps, YouTube, Google Apps, Gmail and Google+. When Google may flesh out its Google Now skeleton for Chrome is unknown. Asked by The Next Web about the subject, a company spokesman replied, "We're always experimenting with new features in Chrome but have nothing to announce at this time." Meanwhile, Google continues to pump up Google Now's versatility. Last week, for example, Google added features to the service similar to those in Apple's Passbook app. Those features include the ability to scan your Gmail inbox for a boarding pass for United Airlines and automatically display a card with a QR code that can be used to check in for your flight.